Fort William to be renamed “64 Miles to Inverness”. The favourite emerged after a tight contest with “Willystan”, “TURN BACK” and “Forty McFortface” all coming close. “The question we asked ourselves is do visitors want the good news or the bad news?” said local Tam MacParsnip. “The good news being that they only have 64 miles to go till they reach a KFC or the crushingly disappointing news that they are in Fort William”. 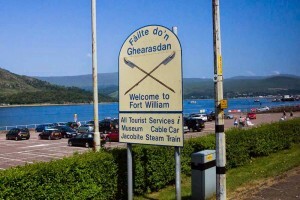 “Personally, the last thing I want when driving around the town is to be reminded that the town is infact Fort William”. “Also this will save a fortune on new signage. We will need at the money we can get to de-soviet the bypass and town center”. Fort William was built in the 1960’s in the scenic West Highlands as a cruel joke. Donations gratefully received to pay for hosting, growing the site and no more than 3 pints a week. Chan eil gif eile a dhìth. Seo beatha ann an 2019. Another embarrassing faux pas on on our part. Archie the intern will swim for this. Last one. Hands are now numb from typing. What a weekend! The Daily Gael Copyright © 2019.